This course can be taken as a standalone unit or combined with another methodological seminar or any of the method courses. This course provides a comprehensive overview of how to use NVivo to conduct qualitative data analysis. 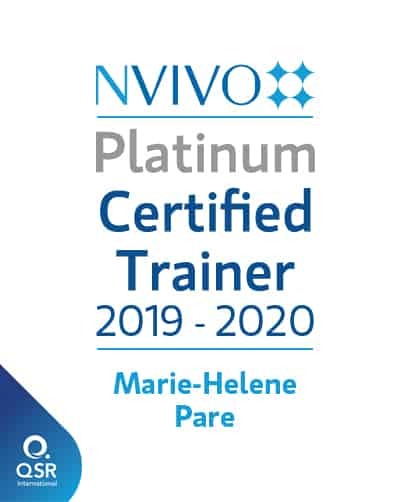 It is the course you need if you already have experience in qualitative analysis but need to know the added-value of using NVivo for qualitative research. The course is structured around four modules that follow the logical sequence of qualitative analysis. You will learn to prepare text, multimedia and social media data; import and organise a dataset in NVivo; manage a literature review; perform automated and manual coding; work with cases and variables; use queries to retrieve data; present findings with visualisations; export data; and share projects. The course is entirely hands-on and uses sample data to provide practice in using NVivo’s functionalities. Note that this course does not cover how to use NVivo for qualitative analysis based on a given method such as thematic analysis, qualitative content analysis, grounded theory, etc. (for this kind of content, see Qualitative Data Analysis with NVivo or the courses on qualitative analysis methods). Although no previous knowledge of NVivo is required, participants should have some familiarity with qualitative research. Two days from 9:00 to 17:00. The course can be shortened to one day on request. This course is taught by invitation only in universities, research centres or institutions. Maximum 15 participants. This course is entirely hands-on. Participants work with sample data, although they may work on their own data for the last hour of the course. Depends on course duration. Please email me for more information. This course can be taken alone or in conjunction with other related courses. It can be taught before, after or simultaneously with any of the methodological seminars or method courses.